I started diving in 1971. I was a pretty good bow fisherman before that. Started spearfishing in 1975, and actually used a double hose regulator back then. My summer vacations were weekends at local lakes in the Midwest, where I competed in the Midwest Diving Council tournaments. I found out that free diving was a lot more fun than scuba, but got in trouble when I was beating the other scuba spearfishermen and wasn’t using a tank. The council quickly passed a rule stating that you had to wear a tank during scuba spearfishing completion. After one of these weekend dives in 1978 Carole and I spent the week camping, diving, spearfishing and got married in our boat in front of the dam at Stockton Lake, MO where we retired in 1998. We then celebrated with our dive friends the next weekend. In the 70’s and 80’s I won first place 10 times in the MDC free diving spearfishing year-end awards. Mike Van Heale, my dive partner, finally beat me after that. I am a freshwater diver. Only shot fish in the ocean once, in 1982 when the Midwest Dive Council and the Florida council teamed up and sponsored a US of A Scuba Nationals in the keys. I have competed in 5 free diving Nationals. In 1987 at Table Rock Lake, MO I had the Ernst brothers on the ropes the first day, but they came back the second day. I placed 3rd individual and 2nd team. I enjoyed the 1990 Nationals again at Table Rock. Diver friendships seem to last forever. 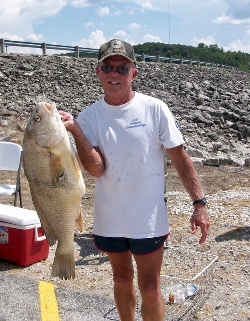 In 2005 I came out of retirement for the Nationals at Table Rock. This Nationals resparked my interest in spearfishing. I thought Nationals at Greer’s Ferry, AR in 2010 would be my last, but my dive partners, Mike Van Haele and Don Hesket talked into diving last year at Beaver Lake, AR. I think the biggest surprise of my diving career was in 1987 when I was awarded the ISUA Diver of the Year. What an honor to be the only fresh water diver to receive this award. No, I can’t say that. The REALLY biggest surprise was shooting the most fish last year at Beaver Lake in the US of A Free diving Nationals at the age of 73.